All hotels reviewed have been visited by us, have not been sponsored by any Hotel or booking agency and are the personal views of our reviewer. La Alcerca is a restored old medieval town in the, heart of the Sierra de Francia and the first Spanish municipality declared a Historic-Artistic Complex. The Hotel Dona Teresa is located 100 meters from the Plaza Mayor with its many bars and cafés with views of the Sierra, the Sanctuary of La Peña de Francia and facing the Valley of the Batuecas. There are many small shops off the Plaza mayor and if buying wine while there, try the little supermarket on the square. It is an interesting place to visit as steeped in History. The houses around the square are very old and some covered in flowers. 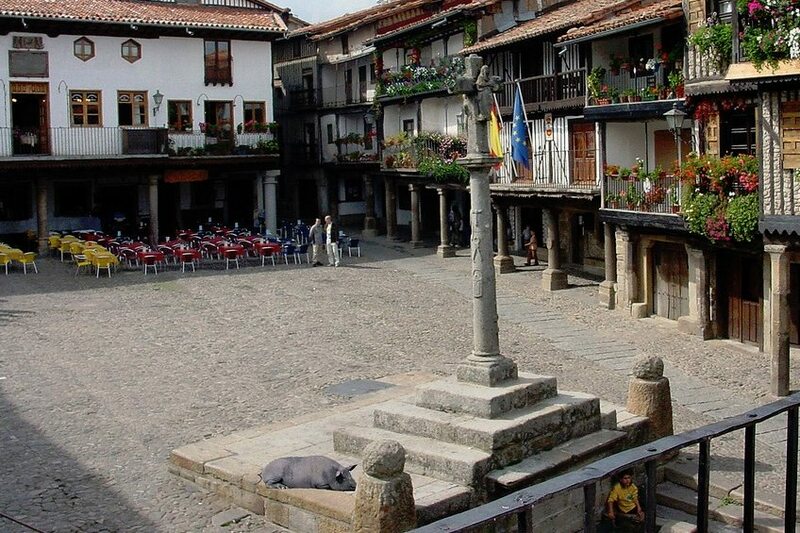 The countryside is beautiful and the town is not far from Cuidad Rodrigo that is well worth a visit. It can be very hot in summer and comes alive after about 9pm when the square is full of tourists and locals enjoying an evening drink in the cooler air. The hotel Dona Teresa has underground parking, a bit hairy to get into if you have a big car. Not much English spoken and the first receptionist wasn’t very welcoming, but the replacement later was charming, helpful, and didn’t mind us trying out our rudimentary Spanish on her. It is a typical old Spanish building that feels rooted to its surroundings. The swimming pool shown in some adverts is not located next to this building but in a different location. It is advisable to check with the Hotel the exact location if it is something you want. The rooms had air conditioning, were clean, beds comfortable and there was a small terrace off the room to sit and while away an hour or two in the heat of the day. The terrace overlooked the medieval rooftops and gave an unusual view of the town. There is a nice terrace outside the Hotel by a running stream for a pre evening meal or drink. They had a large party staying at the time of our visit and that may be the reason the evening meal in the restaurant was disappointing and we had to wait a while for the breakfast buffet to be replenished next morning. The room, breakfast and evening meal including all drinks and tax cost 176 euros for two, one night in June 2017. Don’t forget to take out travel insurance when booking your hotel or holiday. Remember www.thatsinsurance.com reviews all travel insurers on the internet and helps you decide on the best travel policy for you at the click of a button.